about comfort and stylish design. 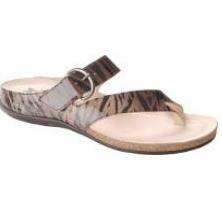 Beautiful shiny zebra print patent upper. Suede footbed with a resilient cork midsole. Instep strap with buckle ease the fit over your instep. maintain their continued confidence is Mephisto’s ongoing challenge and aim.